35+ Central Division Champs, the Connecticut Top Hats. JUPITER, FL – Rob Ayala made a promise to manager Bob Manowitz and more than kept his word. Because he did, the Connecticut Top Hats became unlikely champions. Ayala, who said he’d carry a Top Hats team that found itself down to nine players, finished 3-for-3, Chris Chance shook off a tough start to pitch seven effective innings and Bob O’Brien got his third save in as many chances without allowing a run as Connecticut earned a come-from-behind 7-4 victory over the Suffolk (NY) Indians in the 35 Central Aluminum Championship game. 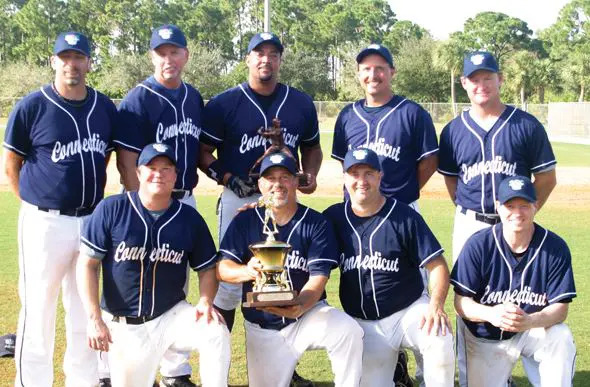 The Top Hats, who had just nine players remaining after two, who were playing for a pair of teams in the tournament, left to play another championship game scheduled for the same time, completed an unbeaten tournament to finally earn their first title. It came after 10 years of traveling to Jupiter and a year after falling in the championship game to the St. Louis Perfectos. Connecticut finished round-robin play 5-0, including a 5-0 victory over Suffolk, before riding the seven-inning, three-hit pitching of Rich Lee to a 6-1 playoff victory over Zookies to earn a second straight berth in the title game. Suffolk lost only to the Top Hats and then dominated a pair of playoff foes, beating D.C. Mustangs 17-1 and Carolina Indians 8-1. Early in the championship game, it appeared the Indians were on their way to another blowout victory. Scott MacMillian’s bloop single to right with two outs in the first scored Steve Quiroz for a quick 1-0 lead. Then, after Connecticut tied the score in its half of the inning on Ayala’s RBI single, Suffolk grabbed a commanding 4-1 lead thanks to a run in the second and two more in the third on Seth Moskowitz’s two-out single to left. Not surprisingly, Ayala started the comeback. His double in the fourth was followed by Wally Hurd’s double to cut the deficit to 4-2. An inning later, Andre Lambros’ one-out single scored Terry Marrs and suddenly, the Top Hats were within 4-3. In the sixth, Connecticut completed the comeback thanks to some untimely Suffolk miscues. Ayala singled and scored the tying run on an error, before Hurd scored the go-ahead run on another miscue, giving the Top Hats a 5-4 lead they wouldn’t relinquish. Meanwhile, Chance had settled down to keep the Indians’ bats in check long enough to turn the game over to O’Brien. The righty hadn’t allowed a run in 12 innings entering the final and, after Connecticut added critical insurance runs on RBI singles by Billy Bardes and Lambros in the eighth, all that was left was another dominant effort by its closer. O’Brien retired all six batters he faced and Connecticut had finally earned its elusive title.